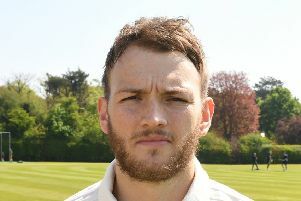 Woodhall Spa CC’s Firsts suffered an agonising three-wicket defeat at the hands of Sleaford on Saturday in the Lincs ECB Premier League. It was a game that the Spa men never really had control of, yet Jack Luffman’s side was bitterly disappointed not to take the victory over their hosts. Luffman won the toss and elected to bat but his men were soon in trouble at 32-4 when he joined Sri Lankan Harsha Vithana at the crease. The pair steadied the ship somewhat and began to take control of proceedings with a partnership of 40 before the captain was trapped LBW to his Sleaford counterpart Tom Shorthouse for 12. This brought wicket-keeper Brandan Laurenzi to the crease. The young New Zealand player continued where his captain had left off and he and housemate Vithana began to build a healthy partnership. During this time the latter went past a well-deserved half century for the fourth time this season, and he really is a calm and class act at the crease. At 165-5 with 12 overs to go the Spa were seemingly well placed but what followed was another all-too-familiar collapse that would eventually see them bowled out for 188 in the 48th over. Laurenzi holed out do deep square leg for a well-crafted 39 and Vithana was the last man out for a fine 79, an innings that included seven fours and one six. Despite the annoyance of again not batting out the overs, Spa felt they were in with a chance but their start with the ball mirrored the batting. They had taken three wickets in the first 10 overs, thanks to Alex King, but they had come at heavy cost of 75 runs and this would eventually prove crucial in the run chase. However, Spa dug deep and spinners Prasanna Jaywardene (1-30); Ross Dixon and Vithana (1-27) put the brakes on and built some pressure to reduce the home side to 88-5. Enter the home side’s New Zealand all-rounder McPeake who had earlier taken three wickets. He knew he was the key wicket and he decided to fight fire with fire and, on this occasion, he was successful smashing 48 from 36 balls before being excellently caught at long-on by Jack Cooke. Spa still smelt victory and did claim a further victim but eventually the home side got over the line. Spa will look to bounce back on Saturday when they host dangerous Bourne at noon. At home it was an equally exciting and tense affair as the Second XI claimed a one-wicket win over Long Sutton in the South Lincs and Border Premier Division. Chasing 221 for victory, the Spa were cruising to victory following a pleasing return to form for captain Matthew Sargeant who scored a fine 65 and a flourishing partnership between Adam Barker (24) and James White who had taken their side to within 30 runs of victory upon the former’s dismissal. However, at this point the visitors smelt blood and took three more quick wickets to reduce the home side to 216-9 when 14-year-old Ollie Hausermann entered the innings. After a long and encouraging chat with senior partner White he superbly blocked out the remaining three balls of the 29th over to ensure that the latter had time to asses which ball he was going to attack next over to take his side to victory. White chose the third and he smashed the ball over mid-wicket to claim the victory and finish unbeaten on 36. Earlier in the afternoon, Spa’s bowling attack had stuck to its task well on a good batting pitch and quick outfield. White impressed with the new ball without any luck but the eight wickets taken were shared between Sam Cherry and Matt Haslam. Cherry finished with 3-44 but Haslam, probably not at his vert best, proved his wily worth claiming 5-56 form his 12 overs. They were well back up in the field with wicket keeper Alex Hodson taking two catches as did Barker. Sunday was a tale of two maiden centurions as both Brandan Laurenzi and Henry Wilson both reached the magical three figure mark for the first time in their careers as both the Wanderers sides claimed excellent victories. The Firsts chased 187 to win away at Bracebridge Heath with Laurenzi scoring 103, an innings that saw him pounce on anything loose and short enabling him to reach such a momentous score. Harsha Vithana and Matthew Sargeant both scored quickfire 20s as Spa reached the winning line. Away at Billingborough, the Seconds won by seven wickets thanks to a superb 126 not out from Henry Wilson. The 17-year-old hit 20 fours on his way to his milestone and helps his side chase 184 for victory. He shared a 137-run partnership with Matthew Ashford (32) as the young Spa top four made light work of the run chase. Earlier, Adam Barker’s bowling attack had all performed well with four of the five in the wickets. John Temperton claimed 3-44 and Chris Lee 3-27 while James White and Wilson each took two apiece.